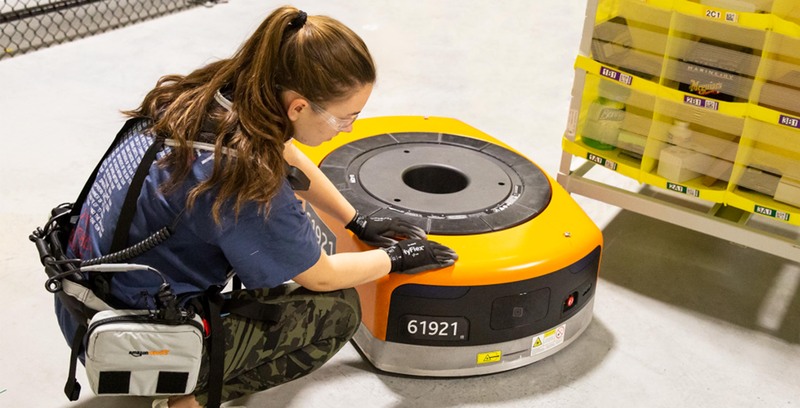 Amazon has developed what it calls a ‘Robotic Tech Vest,’ or RTV, which allows warehouse robots to detect humans better. The RTV was made to ensure human-robot interactions are smoother and safer than before. Considering that Amazon has more than 100,000 robots in its warehouses, its easy to see why safety is paramount. Typically, robots and humans work in separate areas of the warehouse to ensure there are no conflicts. Amazon’s warehouse bots carry shelves of goods around in these cordoned-off areas. However, sometimes a robot breaks down or drops something, and a human has to go in to fix things. Amazon’s vice president of robotics, Brad Porter, told TechCrunch that associates would have to mark out a grid of cells where they’d work. The robotic traffic planner would then smartly route around that region. “What the vest allows the robots to do is detect the human from farther away and smartly update its travel plan to steer clear without the need for the associate to explicitly mark out those zones,” said Porter. In other words, employees wearing RTVs could enter the robot-controlled areas of the warehouse without taking the time to reroute traffic. This would improve the response times to incidents and hopefully safety as well. Hopefully, the new RTV system helps improve robot-human interactions in Amazon warehouses. As recently as December 2018, the company saw a warehouse incident involving bear repellent and a robot that sent some two dozen employees to the hospital. The RTV could help reduce such events.